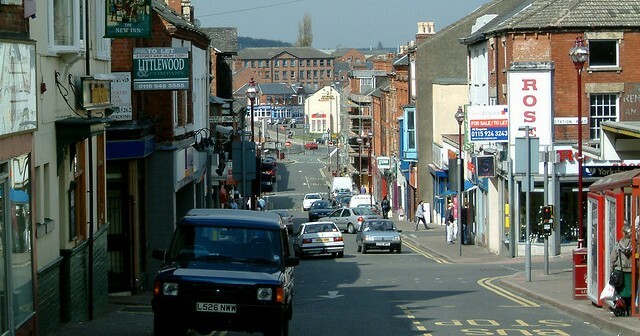 What can we say about this old market town in the south of Derbyshire that hasn’t been said already? Ilkeston should be a wonderful little town full of traditional, working class people going about their business like anyone else. Instead what you have is a chav-infested hole of a town full of alarmingly young teenage mothers who care more about their next sexual conquest or the text message they have just received on their mobiles, than they do about the poor child in the filthy pushchair in front of them. Next to these frightening, cheap gold-chain-wearing pieces of filth, there will almost always be a male chav of even more frightening proportions. With scabs around his mouth, the obligatory white tracksuit, baseball cap (some even still wear them sideways – form your own opinions! ), cheap trainers, Lambert and Butler ciggies, cans of either Carling or – if the Giro hasn’t yet come – Dr Pepper and a look on his face like a buldog chewing a wasp, he looks about as far removed from humanity as you can imagine. The typical venue for these pieces of filth is – as always – McDonalds but they are also to be seen outside any of the shops in the town hurling abuse at anyone who is black, disabled, old, young, wears glasses, has more than one brain cell, can walk upright or who doesn’t match the above description. Ilkeston has always been a very racist town, but it has also been a hard-working, hard-playing town full of otherwise decent people who have worked all week, received their pay on a Friday and pissed it all up the wall by Saturday night. What Ilkeston has become over the last few years is a dumping ground of low-life scumbags who have never had and will never get a job, who scrounge off the state churning out babies just fast enough to keep the Giro and the council house. They bite the hands that feed them by ruining the lives of those poor souls (myself included) who actually go to work to pay the taxes that are then given away by this ‘wonderful’ government to these pieces of crap so that they can further increase the population of scumbags. But, Ilkeston suffers probably most by the fact that it has possibly the worst Council in Britain. Corrupt and useless, the Erewash Borough Council lurch from crisis to crisis, squabbling among themselves, spending money like water on importing more and more low-lifes into Ilkeston from those surrounding areas that they are trying (in vain) to ‘clean up’. The result of all this? Ilkeston has become – like most of Britain – a drug-infested, chav-ridden, filthy, smelly vile hell-hole of a town where it is not safe to walk the streets in daylight, never mind after dark. Where teenaged mothers with more children than brain cells, leech off the few decent people left. Where you can’t walk up the high street to do some shopping without being abused, vomitted on from a second floor flat window (yes, it realy has happened), having objects thrown at you orbeing knocked over by chavs on ridiculously small bikes hurtling headlong down the hill which is the main street. If you ride the buses you run the risk of being set on fire by the children in seat behind who have just been let out of the young offenders institution otherwise called Ilkeston School (and yes, that has happened also! ), or being so traumatised by the experience that you may never set foot out of the house again. Please, I beg of you, if you have even the slightest inclination to visit this compost heap of filth and degredation called Ilkeston, DON’T. If there is a place that can be called ‘hell on earth’, this has to be it. My partner and I long for the day when we can not only get out of this town, but this whole country and experience some civilisation again.